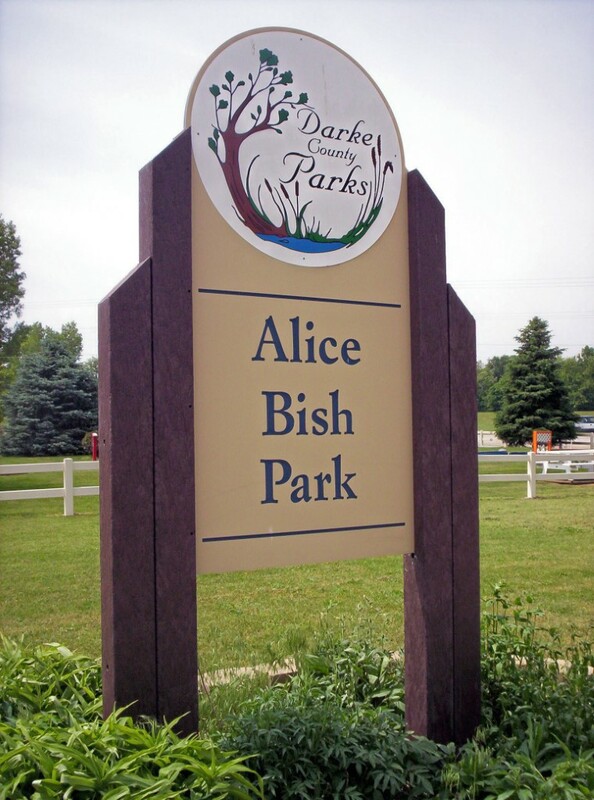 ﻿ Alice Bish Park - Ohio. Find It Here. In May 1994, Chalmer Bish wanted to do "something nice and healthy" for the community. His donation of over five acres of land along Greenville Creek for a park and walking trail was a testament to his commitment to both the community and the health benefits of walking. Today Alice Bish Park, named in honor of Chalmer's wife, provides not only a scenic nature trail along the banks the creek, but serves as the Trailhead for the Greenville Creek Trail extending from Darke County Parks' Alice Bish to the Greenville City Park.Wood Ducks, Great Blue Herons, stately sycamores, and native wildflowers in season greet the visitor as you stroll along scenic Greenville Creek. The nature walkway of Alice Bish Park then loops across the paved Greenville Creek Trail and continues into a peaceful riparian corridor, returning periodically onto and along the paved trail with an eventual return to the trailhead.Canoe and kayak enthusiasts can launch their craft at the Alice Bish Canoe Launch for a float downstream.Easily accessible from Ohio Street in Greenville, Alice Bish Park is located behind the Alice Bish Discovery Center. This park provides the ideal setting for a casual, stroll in any season, with nature and a scenic stream as your companions.